Who is it for? Batiste Dry Shampoo Floral and Flirty Blush is for the people who want to quickly refresh their hair between washes and add volume and texture to their hair with no water at all. Shake the can vigorously. Hold it at a distance of 30 cm from your hair and then spray it onto your roots. Ensure that you massage your hair with your fingertips to cover your roots evenly. You may also brush through your hair to remove the excess product or residue. 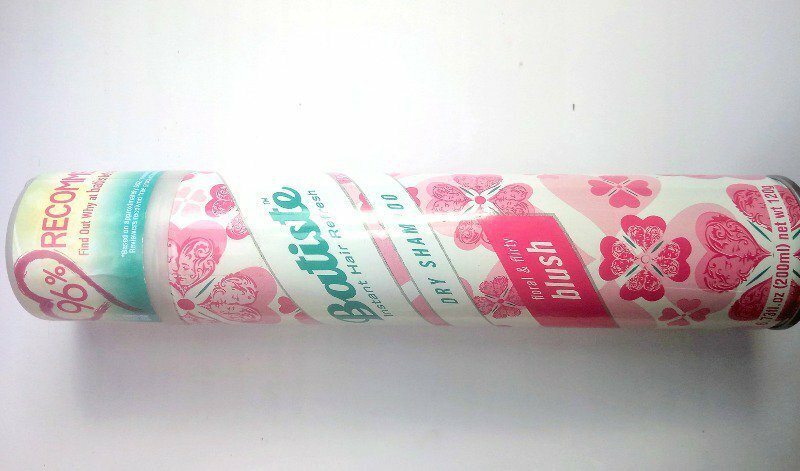 Batiste Dry Shampoo comes in a long can, which has colorful designs all over its body. It has a spray nozzle which works well. All the information related to the product is printed on the back side of the can. It smells extremely good. It actually has a nice floral scent which kind of lingers onto your hair. I am in love with this product. In fact, now I wonder how I was actually surviving without a dry shampoo in my life. It has simply changed my hair game for good. This product immediately freshens up my hair and makes it look bouncy and full of texture. I also use it as a hair setting spray if I’ve set my hair. You have to shake it very well before you use it. Also, this product does leave a white residue immediately after spraying; therefore it should be kept in mind to quickly massage it into your hair roots to avoid a whitish cast on your hair. This product is a savior for me between my hair washes. But it must also be noted that the next day it does sometimes make your hair feel brittle. I believe that one must wash their hair the very next day after using a dry shampoo; it does feel a little unhygienic with a product on your hair and scalp. On having said that, I still totally enjoy using this product. Yes, I would highly recommend purchasing this product as it is very useful. Not everyone every day gets time to wash their hair and we also know that within two days of washing the hair, it starts getting oily, so dry shampoo helps a lot in such cases. The Batiste dry shampoo works wonderfully well on the hair, leaves a minimal white residue which can be removed on immediate massaging, it makes the hair bouncy, shiny and full of texture and also refreshes the hair immediately. The small packaging of the same product is also very traveling friendly and can be used when you go on short trips and don’t want to carry bulky shampoo and conditioners. Even though expensive, I would still suggest you all invest in a dry shampoo, it will change your life forever. Haven’t tried dry shampoo so far but hope this one works..